With Generation X steadily aging, Millennials are slowly taking over key positions at their companies. These roles come with more responsibilities, often including the need to travel for work. The previous wave of road warriors might have set the standard for how companies think about corporate travel, but having grown up in a different time and age, the next generation of business travelers is doing things differently. The lives of Millennials don't look much like those of the generations that came before them. Work isn't just restricted to the office 9-5 anymore — instead, they're often found working flexible hours from home or in a public space like a coffee shop. Some might even decide to turn their day around, instead working in the evening and spending leisure time during the day. At home, things are different too. There are much less responsibilities to think about — only 26% of Millennials are married, while at the same age 36% of Generation X and 48% of baby boomers had tied the knot. Unsurprisingly, childbirth is at a record low — they're getting kids at by far the slowest pace of any generation of young women in US history. Altogether, these and other reasons make for an increased flexibility in their professional lives. This freedom is held dearly, and is reflected during their business travels. While abroad for an extended amount of time, the Millennial traveler likes to spend some extra days off-duty, enjoying their trip. This 'bleisure' experience isn't just limited to additional days added on to a trip, either — it's about constant recreation throughout: anything from dinner and drinks to museum visits. Besides being able to take some time off on a business trip, Millennials don't mind treating themselves to some extras. According to a recent study, they're 60% more likely to splurge on flight add-ons like extra legroom or in-flight entertainment. Bleisure, upgrades — it all sounds like the new generation of business travelers is costing companies a lot of money. But the opposite is in fact true — because of their flexibility and technological know-how, they tend to spend less money on business travel than their generational counterparts. Millennials spending habits and behaviour are so different from their predecessors that even Air France launched an airline just for them. First off, they're flexible, which means they don't necessarily need to pay up for an expensive flight in a popular time slot — they might as well take one a couple of hours or days later. Secondly, they know price comparison websites like the back of their hand. By taking the time to check flight fares or hotel deals online, they can save a lot of money. Also, instead of opting for a cookie-cutter four-star hotel, they are more likely to choose for the charm of a quaint AirBNB, saving them hundreds of dollars per night. Having grown up with technology all around them, this generation has high standards for the travel and booking experience. Nobody born after the 70s wants to have to call someone to arrange a trip — if you can't manage your booking from an online environment, you're bust. 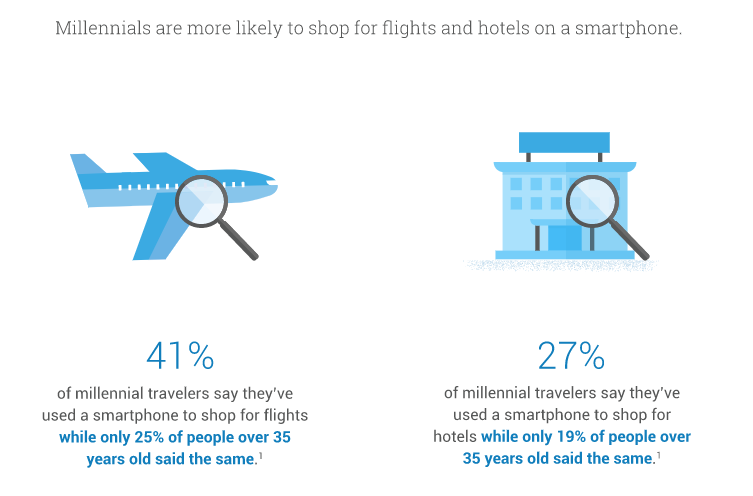 Online check-in, social media customer support and a modern user interface are just a couple of things they're looking for in a travel product. This puts increased pressure on the industry to keep innovating in their offerings by refining its website or launching a mobile app. A great way for companies to deal with changes is to use a travel managing platform like Maya, which combines lots of desired features into one package. As the company's central travel hub, it offers easy price comparison and booking management that employees can access directly from their smartphone. At the end of the day, if companies want to keep attracting young talent, they'll have to take a hard look at their travel policy — does it fit the demands of a new generation of business travelers? If not, it's about time to make some changes.